This edited article about the United States of America originally appeared in Look and Learn issue number 419 published on 24 January 1970. The two men, old friends and army comrades, had been given leadership of the expedition by President Jefferson, for whom Lewis had earlier worked as private secretary. Even before the Louisiana Purchase, Jefferson had been making preparations for such a mission, and in Lewis and Clark he picked the right men to lead it. From the junction of the Mississippi and Missouri Rivers, they made the difficult trip up the Missouri, and reached a point near what is now Bismarck, where they spent the winter among the Mandan Indians. Unlike later travellers, they befriended Indians, many of whom had never seen white men before, and they had only minor troubles with them. Amazingly, of the 32 people who set out from the winter quarters in the spring, 1805, all returned safely. The only casualty of the whole expedition was a soldier who had died earlier of appendicitis. It was at the winter quarters that Sacajawea, a young Shoshone Indian girl, and her French-Canadian husband, joined Lewis and Clark. An invaluable asset to the expedition, she helped to guide it, and interpreted for it when Lewis and Clark reached her Rocky Mountain homeland. Only about 18 years of age, Sacajawea, whose name means “bird woman”, carried a baby thousands of miles on her back throughout the long trek – a fact, among others, that did not go unappreciated by later Americans. There are more statues of her than of any other American woman! Undoubtedly, the greatest moment of the expedition was its arrival at the Pacific, when it reached the mouth of the Columbia River on 7th November, 1805. After that there followed a cold, wet winter at Fort Clatsop, which was built by the expedition before it set out again. On the way home, Lewis and Clark split up to explore the area more fully. Afterwards they rejoined each other, and arrived back near St. Louis in September, 1806, with a wealth of new knowledge, many maps and a great deal of scientific information. Sacajawea stayed in the West with her husband. The first recorded account of North Dakota was in 1738, when the territory was visited by a French explorer. France vied with Spain for possession of the area, but, if anything, it belonged to the Indians. This was the territory of famous tribes like the Sioux, the Cheyenne and the Cree, some of whom can still be found there. This edited article about Polar exploration originally appeared in Look and Learn issue number 377 published on 5 April 1969. For more than four years, the steamship Victory was the only home that Captain John Ross and his crew knew. Unable to communicate with the outside world, Ross patiently waited for the ice to melt. But as the months went by and this showed no signs of happening, he realised that something drastic must be done. Although he did not know it, he and his crew had already been given up for dead; at home in Britain, the men’s families were in mourning, and there was no move to send out any rescue vessels. On 29th May, 1832, Captain Ross decided to abandon ship. He and his crew did this with mixed feelings, for although they were glad to be leaving the ice, they had regrets about deserting the Victory. The ship’s colours were hoisted and nailed to the mast, and a final toast was drunk. 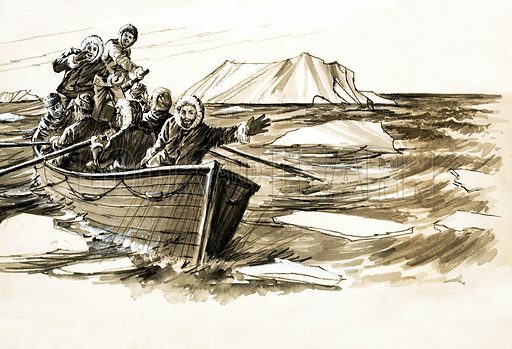 Then the crew of the Victory started out on one of the most arduous journeys in the history of Polar exploration – and certainly one with a most unexpected ending. This edited article about Saints originally appeared in Look and Learn issue number 330 published on 11 May 1968. On the 5th Sunday after Easter (May 19th) there occurs a minor Saint’s Day of special interest to the English, and particularly to Londoners. 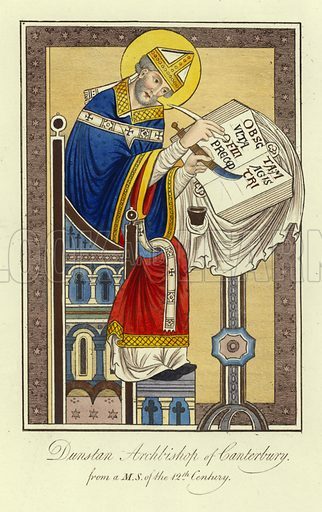 It is St. Dunstan’s Day. Dunstan was a Saxon, born of noble family in the 10th century, and educated at the famous monastery of Glastonbury. In those days the Saxon kings often regarded monks as their most trustworthy advisers, for they were unlikely to be people seeking wealth or favours for their family, as did so many others. Dunstan became adviser to several kings in succession, and though Edwy banished him from the court, his successor, Edgar, recalled Dunstan from exile in Flanders, and made him in turn Bishop of Worcester, then of London, and finally Archbishop of Canterbury. As well as helping to rule Edgar’s turbulent kingdom, Dunstan devoted the remainder of his life to the reform of existing monasteries, and the founding of new ones, including those at Ely and Peterborough. In an age when many monks had become careless and lazy, he set a new standard of strictness and devotion. 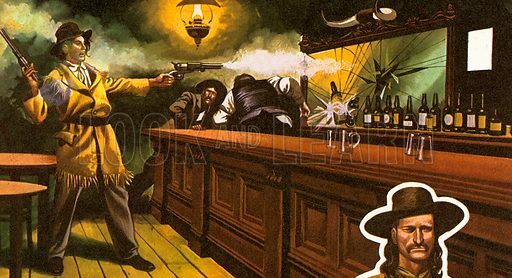 He was also an accomplished musician, artist, and silversmith. He was buried in his own cathedral at Canterbury at about the date of his own feast day, in the year 988 A.D.
Eighteen churches in England are named after St. Dunstan, including two famous ones in the City of London, as well as a number of schools, hospitals, and other institutions, including the charity established to help those blinded as a result of war. The original London Pavilion was located on the north-east side of Piccadilly Circus. 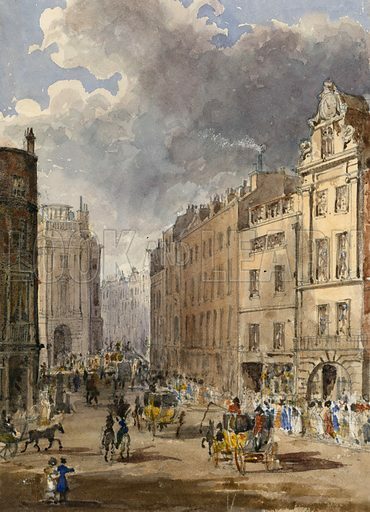 It was designed by Loibi and Sonnhammer and occupied two buildings, the facades of which can be seen in the right of this contemporary watercolour. The first London Pavilion was basically a music hall staging popular entertainment for the lower middle and working class Londoner, as well as for louche upper class gentlemen like Oscar Wilde’s Dorian Gray. This theatre lasted from 1859 to 1885, during which time its hotch potch expansion involved covering over the large yard of the Black Horse Inn. These buildings were demolished as part of the development of Shaftesbury Avenue and in 1885 a new theatre was built which served as the prototype for the grander deluxe music halls of the late Victorian and Edwardian period. Many more pictures of London music halls can be found at the Look and Learn picture library. This edited article about W M Thackeray originally appeared in Look and Learn issue number 257 published on 17 December 1966. The small, pale-faced boy felt lost and bewildered as he stood amidst the rush and bustle of the quayside at Calcutta, in India. He was about to embark on the most thrilling journey of his short life, the voyage to his ‘home’ in England – a country he had heard so much about, but never seen. Five-year-old William Makepeace Thackeray was not excited at the adventure before him. He was sad to be leaving his widowed mother and his relatives and friends. He missed his pet monkey, who was not allowed aboard the three-decker ship, Prince Regent. William’s father had been an important official of the East India Company, but the harsh climate of India had never really suited him, and he had died early in 1816. Mrs. Thackeray had decided to send William to live in London with his Aunt Charlotte Ritchie, so that he didn’t suffer unnecessarily in the cruel Indian sun. His mother was going to marry an army captain, and she promised William that she would come to England after her marriage. So, in December, 1816, William set sail. He was accompanied by his cousin, Richmond Shakespear, aged four, and a trusted Indian servant. As his mother waved the ship out of sight, she little knew that William was to become the foremost writer of his day. On the voyage home boatloads of passengers from the Prince Regent visited the Atlantic island of St. Helena, where Napoleon Bonaparte had been imprisoned in 1815. The infamous ‘Boney’ was said to eat children alive. William persuaded Lawrence Barlow to take him to Napoleon’s garden, where they saw a short, worried-looking man pacing feverishly to and fro, hands clasped behind his back. 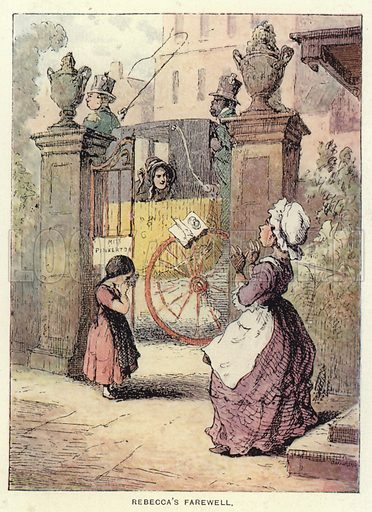 William won the admiration of everyone on the Prince Regent by sketching the Little Emperor in his garden jail. His drawings, however, were not conventional portraits. They were caricatures showing a midget Napoleon almost hidden by giant-sized guards. It was this talent for clever exaggeration that was to gain William more praise – and also land him in trouble! This edited article about Roman Catholicism originally appeared in Look and Learn issue number 249 published on 22 October 1966. On ceremonial occasions, the Pope is preceded in procession by the cardinals, resplendent in their red robes. The Pope is borne along on his throne by the Papal Guards, and thousands of people throng the route to see the Pope and receive his blessing. Cardinals in the Roman Catholic Church are like princes in a kingdom. They make up what is known as the Sacred College of Cardinals. The cardinals form the Pope’s council. 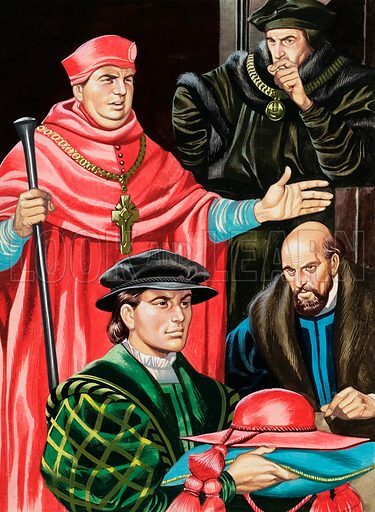 When a Pope dies, they meet ‘in conclave’ to elect a new Pope from amongst their own number, and during the vacancy they have to direct administrative matters and watch over the interests of the Church. Bishops and archbishops are elevated to the College of Cardinals by the Pope. The number at any given time in the past has varied greatly, ranging from below 20, but not as a rule being above 70. The last Pope, John XXIII, and the present one, Paul VI, have increased the number, so that since 1965 there have been 100 or more, the highest number ever. This edited article about Otho and Vitellius originally appeared in Look and Learn issue number 800 published on 14th May 1977. As General Marcus Otho looked into the lifeless eyes of his old friend Servius Galba, whose severed head had been brought to him spiked on a private soldier’s spear, it must have seemed to him that his troubles were nearly over. At least he could now be called the Emperor of Rome. That was a title Otho wanted more than anything else in the world – not, strangely, for the power it would bring, but for the money. For Otho was nearly bankrupt. The reason was that he had spent most of the past 20 years literally buying his way up the social ladder of Rome. He had thrown colossal banquets, given magnificent presents to important people. When it seemed more and more evident that he was a likely candidate for the Emperor’s throne, he spent even larger sums, gambling on getting the job and clearing off his debts at the Roman taxpayer’s expense. Then the new Emperor Galba, who had been Otho’s long-standing colleague in governing the Roman province of Spain, had dropped a bombshell. Instead of naming Otho as the heir and successor, as Otho had confidently expected, he named instead an inexperienced nobleman, Lucius Piso. Otho was flabbergasted. He had risked everything on following Galba, who was 73 and highly unpopular, to the Emperor’s throne. “I might as well fall to an enemy in battle as to my creditors in the Forum,” he had once remarked with disarming candour. Now it looked as if he were really going to fall . . .
Bitterly resentful at what Galba had done. Otho used his last remaining cash to bribe some of the officers under his command to raise the standard of revolt. He felt confident that once they had let it be known that a revolution had started against Galba, many soldiers would join in, and he was right. Galba still didn’t know what was happening and had as yet no reason to suspect his friend when Otho appeared at the Emperor’s side, as he usually did, while a sacrifice to the gods was made. During the ritual a messenger arrived and whispered to Otho: “The surveyors have arrived.” This was a secret signal that enough troops were on his side, and Otho excused himself to the Emperor, saying that some men had come to see him about a house he was buying. Otho went off in a closed sedan chair, “like those used by women,” carried by two bearers. When the bearers began to get tired the general got out and ran. He had almost got to his camp when he had to bend down and tie his shoe-lace. It was then that some of the thousands of soldiers, who had been recruited to back him as Emperor, rushed out and, lifting him on their shoulders, proclaimed him as ruler of Rome. This edited article about London originally appeared in Look and Learn issue number 764 published on 4th September 1976. “London, thou art the flower of cities all!” The poet William Dunbar was clearly impressed. He had come down from Scotland with his master, the Scottish Ambassador, for a Christmas Day feast at the Lord Mayor of London’s palace in 1501. Unfortunately it was true that Londoners did go in for a lot of anti-foreign riots, insults and sometimes murder. Sometimes things really got out of hand, as on the ‘Evil May Day’ of 1517. Young apprentices of London had been bullying foreigners for months. The city aldermen decided to have a curfew on May Day night. But the youngsters had been looking forward to letting of steam on May Day, and they simply refused to go indoors when the bells tolled. Instead they attacked one of the city fathers. 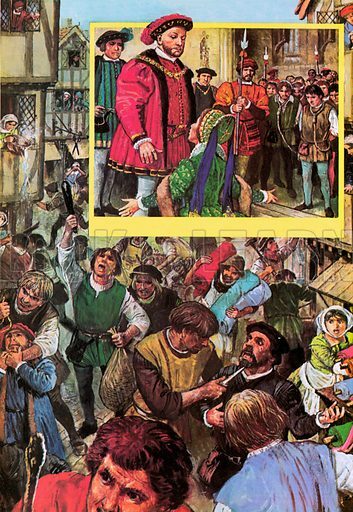 A riot started, windows were broken and King Henry VIII decided that the Mayor and Corporation had lost control. In his opinion, these rioters were committing treason by assaulting foreigners who were under the King’s personal protection. London’s urban government was breaking down in the face of problems that would daunt even the modern Greater London Council. Things really got bad when huge areas of England were fenced off for sheep pastures, forcing peasants to go to the cities in search of a new life. Their numbers were later swollen by refugees from religious persecution in Europe, and London’s population soon rose to 200,000. Most had to live outside the city wall. This meant that they were generally outside the city’s control as well, and ghastly slums started to appear. Homeless, starving people became a threat to those lucky enough to have work. These included redundant soldiers, peasants driven from the land and, after King Henry VIII had got rid of the monasteries, hundreds of monks and nuns, who had been left to beg in the streets. This edited article about Jan Bozdech and Antis the Alsatian originally appeared in Look and Learn issue number 716 published on 4 October 1975. Air Gunner Bozdech and his pilot, Pierre Duval, were shot down over the area of no man’s land between the French Maginot Line and the German Siegfried Line on 12th February, 1940. As they picked their way through the shelled ruins of a deserted farmhouse, Jan suddenly had the feeling that they were being watched. He was right. In the centre of what was once the farm kitchen the keen eyes of a young, orphaned Alsatian were cautiously observing their every move. Jan fondled the animal which had now overcome its initial suspicion of the two strangers. “We can’t leave him here” he said, and he tucked the small pup into his flying jacket for protection. 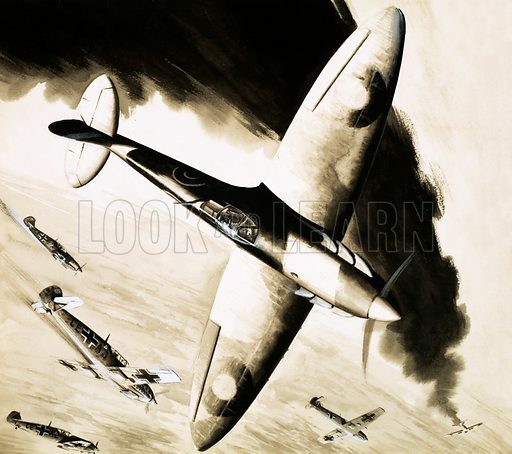 Jan and Pierre made their way back to the French lines and, with the help of his fellow Czechoslovakians who were serving with the French Air Force, Jan decided to call his new friend Antis after the A.N.T. bombers used by the Czech Air Force. Antis became so devoted to his master that he went aloft with him during sorties, lying contentedly at Jan’s feet through even the thickest of raids. This edited article about conservation of buildings originally appeared in Look and Learn issue number 712 published on 6 September 1975. ‘An Englishman’s home is his castle,’ we say. And this applies to Scottish and Welsh people, too, for their castles have been their homes, perhaps for eight or nine centuries. But these are stone-built fortresses, like Alnwick, Berkley, Caernarvon and Glamis. Because they were constructed of the most enduring materials, they have survived. Ordinary folk, however, lived in houses of brick in the eighteenth, nineteenth and twentieth centuries. 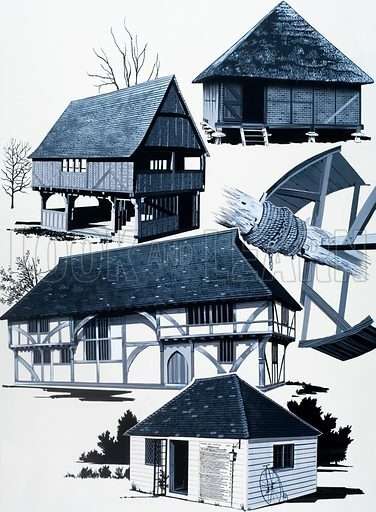 Before that, most houses were timber-framed, with ‘wattle-and-daud’ – rough plasterwork stuck on to laths and split hazel wands and the like as infilling. Brick-built houses stand up well to time and weather. Timber-built ones, if oak was used and the craftsmen knew their job, also stood the test of time. But not many of them date back beyond the sixteenth century. As for the humbler homes, with poorer quality timber and rough plaster, these have survived less well. Rafters collapse, rain pours in, and soon the whole building is in ruins. In recent years, conservationists (people who feel it to be important to save such buildings), have undertaken the task of locating many of these humbler dwellings and restoring them. Sometimes this has been possible where they stood. In other cases, when site-development or road-widening has threatened them, they have been skilfully dismantled and removed, often over quite long distances, to a new site, and there lovingly restored. At Singleton in West Sussex, for instance, is the Weald and Downland Open Air Museum. Not a museum in the usual sense, but some forty acres of meadowland and woodland on which you can wander about and examine a wide range of domestic buildings that have been brought here and re-erected from their original sites in Hampshire, East Sussex, Surrey and Kent. Where necessary, they have been restored with matching timbers so that they can be seen in very much the condition they were in when they were first built. You will be surprised at the wide variety to be seen. Though it is only ten years since the idea was first put forward, and the site has been open to the public for only four or five years, nearly twenty buildings, large and small, have been assembled. Within the next few years, that number may well have doubled.